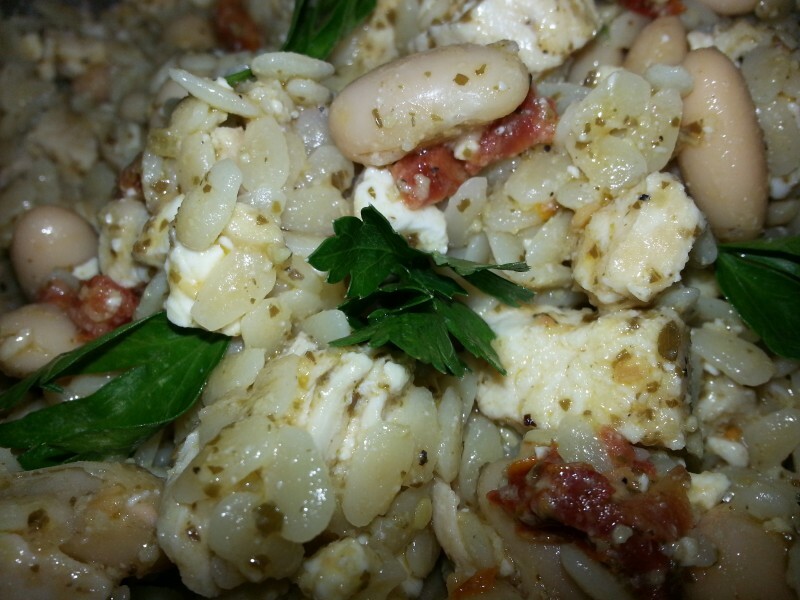 Basil pesto, olive oil, and lemon are tossed together with melon seed shaped pasta which is also known as orzo, feta cheese, cannellini beans, and diced chicken to make this refreshing pasta salad. The salad was easy to assemble. It required no chopping or cutting, except for cutting a lemon in half to get the juice. The end result received Baker’s Man’s seal of approval, and after 22 days of bean recipes, that’s not an easy task. The next time you find yourself wondering what you should make with some leftover basil pesto, consider this recipe. If you want to experience a little more tartness in the final product consider adding a few drops (4-5) of a good quality lemon essential oil to the dressing mix. If you’re wondering about the parsley in the photo, we didn’t omit an ingredient. The problem was that this recipe didn’t photograph well. We added a few parsley leaves on top in an attempt to make it more photogenic. I’m not convinced that it worked. Here’s the printable recipe. Give the recipe a try and let us know what you think. Jarred basil pesto mixed with olive oil and lemon juice makes a delicious dressing for this simple pasta salad. Mix together olive oil, lemon juice, pesto, and lemon juice. Once pasta is cooked, drain it and cool with cold water. Drain pasta thoroughly and toss with basil and olive oil mixture. 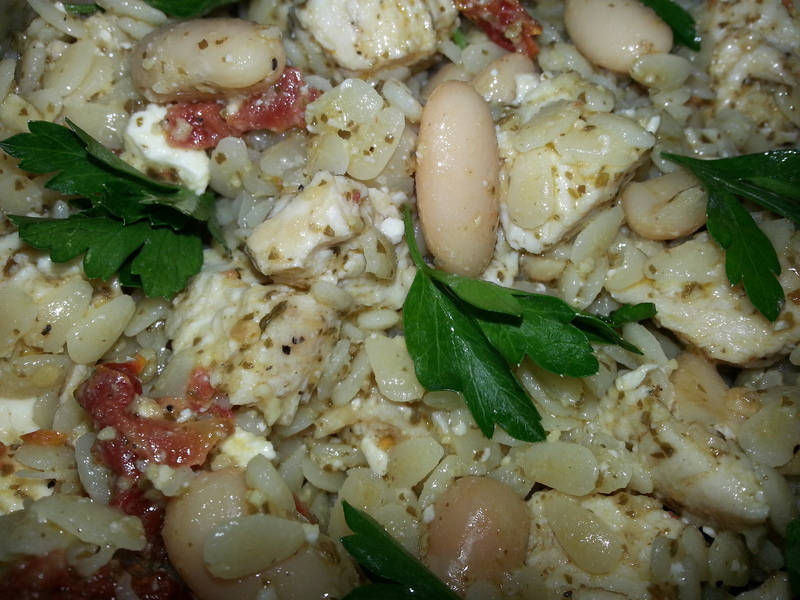 Stir in chopped sun dried tomatoes, cannellini beans, feta cheese, and chopped chicken. This looks good. What melon seeds did you use? I like the lemon essential oil addition. I used orzo pasta, but in the Latin food section of the store, they have pasta that is shaped like Melon seeds. The price is usually 3 or 5 packages for a dollar. One 7 ounce package of pasta measured 1 cup and this made a large volume of pasta salad. 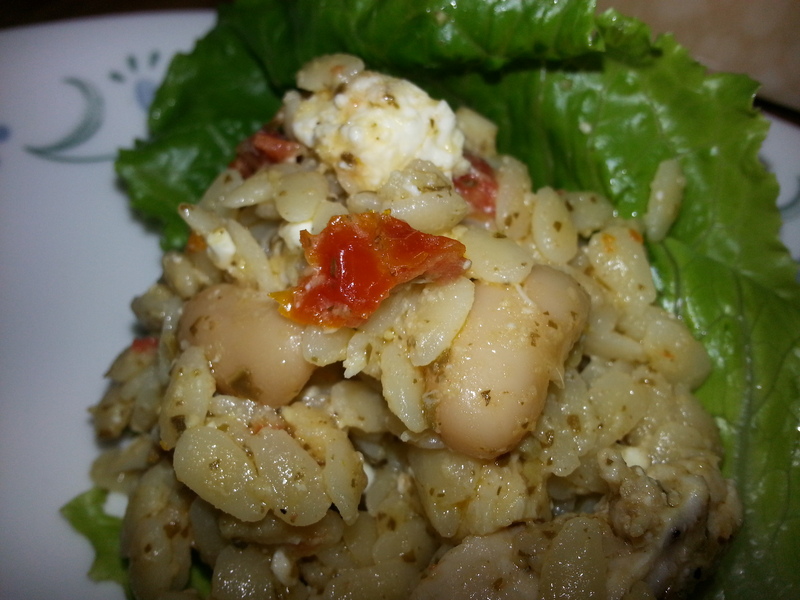 The addition of the chicken makes it a complete meal, and the leftovers made a great lunch the next day. I served it on a bed of salad greens. Yummy!